So I've been making bread for our family every week for several months now. I think it started out because a friend who makes beer gave me a couple loaves of his bread made with the spent grain from the beer - and it was the best bread I've ever had. And then he gave me a whole bunch of the spent grain to try for myself. Since then, I have tried countless bread recipes and combinations, and have come up with a formula that is working really well for us. I started it because it was just something creative to do, and then I realized how good it was, and how easy it was, and how much money we were spending on good quality store bought bread - and it's just become a habit. There's so much I like about it. I love the process - the mixing and creating something alive and watching it rise, the smell of the yeast, the sense of pure goodness from making something so simple for my family - and of course the smell and taste of fresh baked bread simply can't be beat. The only problem - I eat too much of it! I usually make about 2 loaves per week. I bake them in loaf pans because we use this mostly for sandwiches for morning toast and kids breakfast, so a nice uniform loaf makes that a lot easier. A lot of the recipes I tried didn't make enough to fill the loaf pan even when nicely risen, and I would end up with short half-height loaves. So I've adjusted the quantities to fit my needs. Also lately we have been enjoying a tradition of friday pizza night at our house, and I've discovered that my bread dough also works very well as pizza dough. In searching for an experimenting with recipes, I had a few goals in mind. I wanted it to be simple - no separate bowls, no proofing of yeast, no additives. And quick - I want to throw it all in the food processor and go. And I wanted minimal ingredients - this basic recipe is 5 ingredients, including the water. A lot of recipes called for milk - I tested two batches side-by-side with no difference except for milk vs. water, and I couldn't tell the difference - so water is easier. This recipe is closest to Mark Bittman's basic sandwich bread recipe in his book How To Cook Everything, but I have adjusted quantities a bit to suit my needs. Put all of the dry ingredients (even the yeast - no separate mixing with water and sugar is needed as long as your yeast is fresh) in the bowl of the food processor fitted with the dough blade, pulse to combine. Then slowly add most of the water with the processor running - see if it pulls into a ball or needs the rest of the water. I almost always use all the water. Then turn the dough out to a flat surface and knead just a little to finish pulling it together. I really only do this for a minute or so. This is a sticky dough. It will stick to your hands when you first turn it out, but with just a little kneading it usually comes together really nicely. I rarely add any extra flour for this. Put it into an ungreased bowl, cover with plastic and let rise for a couple hours. Punch down, knead a little if you want, shape into an oblong blog and plop it into a lightly oiled loaf pan. Let it rise in the loaf pan. I usually put just a little oil on top to keep it from drying out. once sufficiently risen, bake in a 350 oven for 45 minutes. the flour can be any combination you like, but my typical combination is 2 cups white bread flour and 2 cups whole wheat flour. More wheat flour makes a denser loaf. 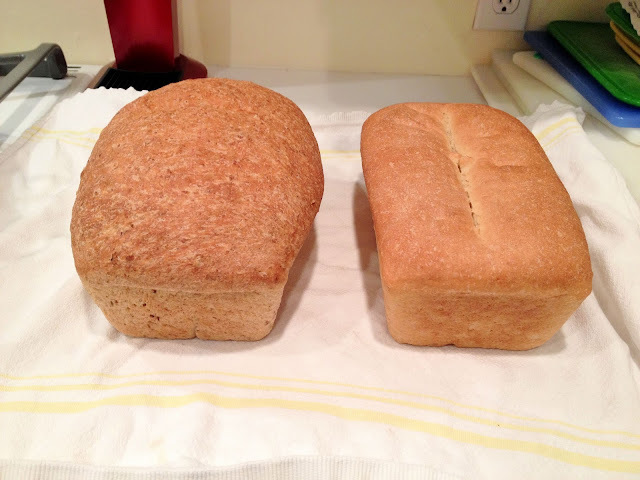 More white flour makes it rise better and you get a lighter more airy loaf. If I am being perfectly honest - I try to use wheat as much as possible because it's healthier, but making a classic loaf of simple white bread is just really, really good. I've also lately done this a few times with 1 cup wheat to 3 cups white bread flour, and that is really nice. If you are using at least half whole wheat flour, the addition of some extra gluten seems to make a big difference. The bread rises better, is easier to roll out, and seems more tender. It's totally optional, but I like to use it when I'm doing whole wheat bread. The recommendation is about a tablespoon per cup of flour. I've tried different types of yeast and it doesn't seem to matter, as long as it's fresh. You can use 1 envelope which is 2 1/4 teaspoons, or if you have the jar I just do 2 slightly heaping teaspoons. You certainly can dissolve the yeast and sugar in the water if you like, if you want to just be extra sure that it's all mixed in. and maybe if you're in a hurry getting the yeast a little jump start will help it rise faster. Salt is really a personal preference. I like my bread a little salty. It also really depends on what kind of salt you use. I was using a Diamond Kosher Salt and 2 tablespoons was great, but then I switched to Morton Kosher Salt and 2 tablespoons made for a very salty loaf - even a little too salty for my taste. So you have to play with it. Less sugar is fine, but it will need more time to rise. Cold water is fine, but it will also need more time to rise as it warms up. This recipe also works with just one rise - I've done that a couple times and honestly couldn't tell much difference - I just mixed the dough and put it straight into an oiled loaf pan and let it rise. For spent grain bread - all the other ingredients are the same but I reduce the water to 1 1/3 cups, as the grain that I've been getting is already moist. I've also tried adding oats, bran, corn meal, etc. - just about anything works but you might have to adjust the water a little. for pizza dough - the white/wheat mix works well, but all white is really, really good. One batch of dough makes 2 - 4 pizzas, depending on how thin you like your crust. An all white crust is more tender and so easier to roll out very thin.